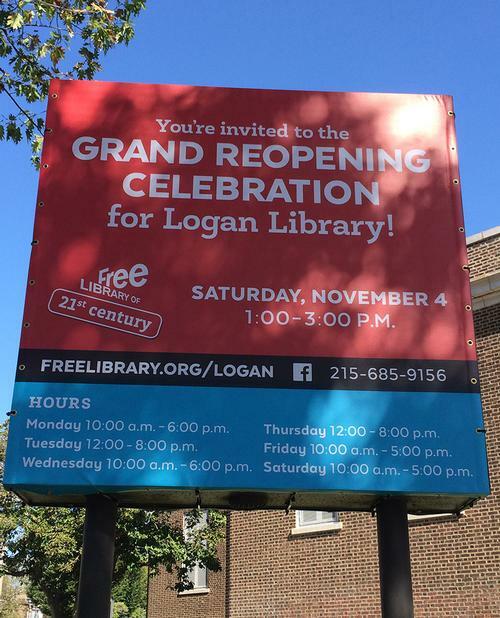 Come one, come all: After a year and a half of undergoing extensive renovation and expansion, Logan Library will reopen its doors on Saturday, November 4! 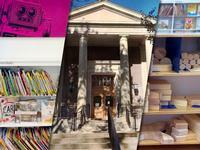 This neighborhood hub, located at 1333 Wagner Avenue, has been reimagined as part of the Free Library’s Building Inspiration: 21st Century Libraries Initiative, a transformational project to reshape neighborhood libraries in Philadelphia to meet the changing needs of today’s library customers. To see some before, during, and after construction images, view our Logan Library photo album on Flickr! Join us for a celebration of this incredible project and community, as we welcome Logan’s North Central Philadelphia neighbors home. From 1:00 p.m. to 3:00 p.m. on Saturday, November 4, neighbors can enjoy live music, balloon art, fun learning activities, crafts, food, giveaways, and more at the new Logan Library. Mayor Jim Kenney will give welcoming remarks at 1:00 p.m., followed by an invocation from Philadelphia Poet Laureate Yolanda Wisher. During the celebration, attendees are invited to explore its new, state-of-the-art spaces and features, including a vibrant Children’s Library, customized Pre-K Zone, and dedicated Teen Zone. Other enhancements include a welcoming, living-room-like space known as The Common; an improved circulation desk; updated program, meeting, and study rooms; and a computer bar. The library has also been made entirely ADA accessible, giving the whole Logan community full access to the library’s space and resources for the first time. The Free Library collaborated with architect James. R. Keller, who specializes in design and planning for libraries, to reimagine this neighborhood library. Original artwork created just for Logan Library by Ife Nii Owoo can be viewed in the Community Room on the lower level. The indoor mural, Read: A Pathway for Hope, focuses on the importance of literacy in the community. The artistic process began with engaging Logan’s diverse community—consisting of African Americans as well as immigrants from the Caribbean, Cambodia, Vietnam, and parts of Africa and South America. Images and colors have been drawn from culturally significant patterns from the community—for example, Madiba shirt patterns from South Africa and Mehindi designs from India. Words from internationally renowned Philadelphia-based poet Trapeta Mayson are artistically interwoven throughout the work. The creation of this mural was supported by the Percent for Art Program, an initiative of the City’s Office of Arts, Culture, and the Creative Economy. The Building Inspiration initiative has been made possible in large part by a historic $25 million grant from the William Penn Foundation—the largest private gift ever received by the Free Library. ADA improvements at Logan Library were supported by funding from the Keystone Recreation, Park, and Conservation Fund—administered by the Pennsylvania Department of Education through the Office of Commonwealth Libraries—and other essential support came from the John S. and James L. Knight Foundation and the Horace W. Goldsmith Foundation. The Free Library is also grateful to Ruth W. and A. Morris Williams, Jr., Toba and Lawrence Kerson, and Janet and Jim Averill, who supported innovative new spaces at Logan Library, as well as the larger Building Inspiration initiative. Mondays and Wednesdays 10:00 a.m.–6:00 p.m.
Tuesdays and Thursdays 12:00 p.m.–8:00 p.m.
Fridays and Saturdays 10:00 a.m.–5:00 p.m. The original Logan Library was built in 1918, using funds donated by the philanthropist Andrew Carnegie, who committed $1.5 million in 1903 for the purpose of building more Free Library of Philadelphia locations. Next year marks the 100th anniversary of this Carnegie library and we can’t wait to welcome the community back to their Logan Library to celebrate! Explore Logan Library's new, state-of-the-art spaces and features, including a vibrant Children’s Library, customized Pre-K Zone, and dedicated Teen Zone. Other enhancements include a welcoming, living-room-like space known as The Common; an improved circulation desk; updated program, meeting, and study rooms; and a computer bar. Original artwork created just for Logan Library by Ife Nii Owoo can be viewed in the Community Room on the lower level. The indoor mural, Read: A Pathway for Hope, focuses on the importance of literacy in the community. After a year and a half of undergoing extensive renovation and expansion, Logan Library will reopen its doors on Saturday, November 4! 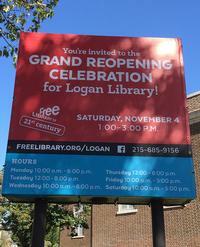 Add a Comment to Logan Library Grand Reopening Celebration!